Whether its landscape photographs, monuments, buildings or industrial facilities, infrastructure projects, insurance or damage claims, archaeological excavations and small finds, art historical treasures or prototypes – with various sensors and combined airborne, mobile and terrestrial 3D scanning technologies, we have the 3D digitisation concept that is exactly right for your project! From the comprehensively and thoroughly compiled 3D stock, we derive precise and varied results: 3D point clouds as raw data, CAD plans or 3D BIM objects suitable for architects, high-resolution photorealistic 3D models, multimedia media productions with 3D animations, modelled “3D worlds” for real-time and simulation platforms or real haptic models with 3D printing and CNC milling technologies. With a dedicated team of more than 20 3D specialists, we are ready for your task! As experts in 3D process chains, we can rely on well over 1,000 successful 3D projects since 2001, including major projects in more than 40 UNESCO World Heritage Sites. Our clients come from the industrial sector, the insurance industry, research institutes and universities, as well as state and municipal authorities and museums. We specialise in complex industrial 3D inventory surveys and the documentation of architectural, artistic and cultural monuments as well as 3D documentation in archaeology and restoration sciences. Please have a look at our range of services! With millimeter-accurate, high-quality terrestrial 3D laser scanners (e.g. 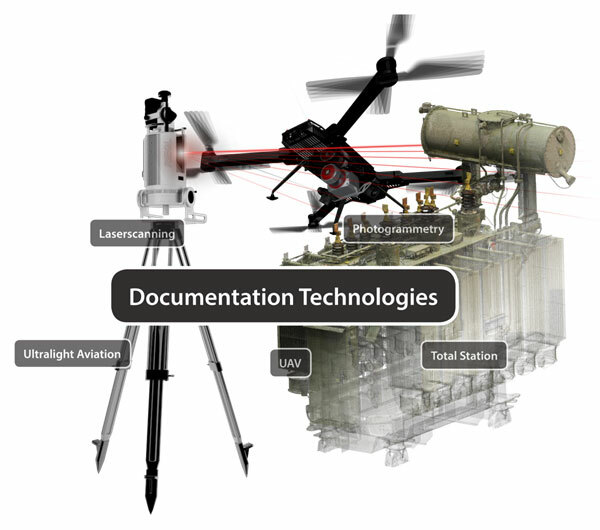 Riegl, Leica Geosystems, Surphaser) and often in combination with other technologies (e.g. hand-held scanners and/or photogrammetry), we are able to capture objects of all shapes and sizes quickly and efficiently. The end result is, of course, a 3D model that meets your accuracy requirements and is photorealistic with the real colors (RGB) of the object surfaces. We document small objects with accuracy requirements that are in the sub-millimeter range with strip projection systems or hand-held 3D scanners, and often combined with macro photogrammetry – from coins to complex church portals. Such combined systems offer the best results, especially for difficult surfaces! This is how we create the data basis for extremely accurate and photorealistic 3D models. Depending on the task, we document objects of almost any dimension with high-quality cameras and photogrammetric software technologies, such as the “Structure from Motion” (SfM) process. From the air with ultra-light airplanes or camera drones (UAV), on the ground e.g. with high tripods, and in the very near macro range with special lenses and professional studio equipment. Depending on the requirements, we document with a high dynamic range (HDR) and generate pin sharp macros with focus stacking. We can also offer you suitable solutions for complex and highly reflective surfaces. We have been using and selling Total Stations and GPS systems (Leica Geosystems) for years, for the purposes of documentation and basic surveying in monument conservation, architecture or archaeological excavations. With our software solutions you can generate automated plans directly from the Total Station and use your own smartphone or tablet to convert incoming data into a GIS & CAD compatible plan in real time. Terrain models, forested areas, infrastructure projects, industrial facilities or architectural complexes can be captured most effectively from the air using airborne laser scanning and/or photogrammetric aerial images. With Airborne Laserscanning, vegetation can be filtered so that precise digital terrain models can be calculated without vegetation and buildings. Depending on the size of the area and the desired resolution, the data can be captured by airplane, helicopter or, more cost-effectively, with our ultra-light aircraft (motorized ultra-light paraglider) or photogrammetric drones (UAVs). We document your survey area quickly, accurately and in high resolution. With our solutions, we achieve very high point densities per square metre (>100 laser measurements), which makes even the information “hidden” under the vegetation precisely visible.